514 pages | 8 B/W Illus. 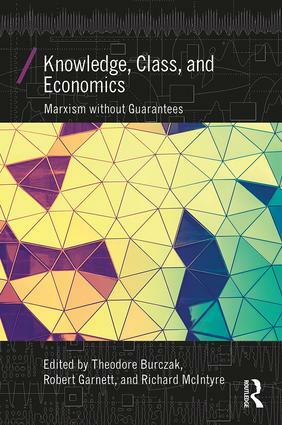 Knowledge, Class, and Economics: Marxism without Guarantees surveys the "Amherst School" of non-determinist Marxist political economy, 40 years on: its core concepts, intellectual origins, diverse pathways, and enduring tensions. The volume’s 30 original essays reflect the range of perspectives and projects that comprise the Amherst School—the interdisciplinary community of scholars that has enriched and extended, while never ceasing to interrogate and recast, the anti-economistic Marxism first formulated in the mid-1970s by Stephen Resnick, Richard Wolff, and their economics Ph.D. students at the University of Massachusetts-Amherst. The title captures the defining ideas of the Amherst School: an open-system framework that presupposes the complexity and contingency of social-historical events and the parallel "overdetermination" of the relationship between subjects and objects of inquiry, along with a novel conception of class as a process of performing, appropriating, and distributing surplus labor. In a collection of 30 original essays, chapters confront readers with the core concepts of overdetermination and class in the context of economic theory, postcolonial theory, cultural studies, continental philosophy, economic geography, economic anthropology, psychoanalysis, and literary theory/studies. Wolff and Resnick’s Interpretation of Marx’s Theory of Value and Surplus-Value: Where’s the Money? Homelessness as Violence: Bad People, Bad Policy, or Overdetermined Social Processes? Theodore Burczak is Professor of Economics at Denison University and author of Socialism after Hayek. Robert Garnett is Associate Dean and Honors Professor of the Social Sciences in the John V. Roach Honors College at Texas Christian University, USA. Richard McIntyre is Professor of Economics and Chair of the Economics Department, University of Rhode Island, USA.